We all know it: Bridge Rd is Richmond’s classic middle child. The Jan to Swan Street’s Marcia. It doesn’t have the authentic Vietnamese of Victoria St, and it’s probably about 5 years behind Swan in the ‘hip and happening’ stakes. And like most middle children, it went off the rails for a while there. But we’re happy to report, Bridge Rd has made a comeback in recent years. There’s a solid mix of restaurants, bars and cafe on the strip now, running all the way from the river to Punt Rd. We’ve picked out some of our favourite restaurants on Bridge Rd for your eating pleasure. Enjoy. Brew pub and restaurant all in one. Burnley Brewing took over the old Romulus & Remus, and kept a lot of the kitchen staff on during the transition. That’s why you can still find the old crispy gnocchi with peas and chorizo, and house-baked pizzas, topped with prosciutto, fig jam and walnuts (don’t mess with a winning formula). The Burnley boys also recently installed a 5-hectolitre beer tank on the premises, which should keep the good times flowing all night. Order up a serving platter, grab a booth and settle in for a serious session. 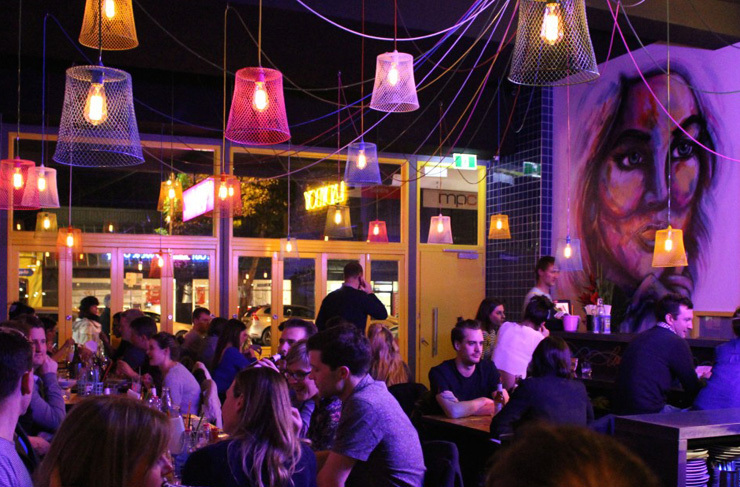 You wouldn’t give this place a second glance in the CBD, but there’s a reason it’s packed out most weeknights. Piano does some of the best Thai food in Richmond. 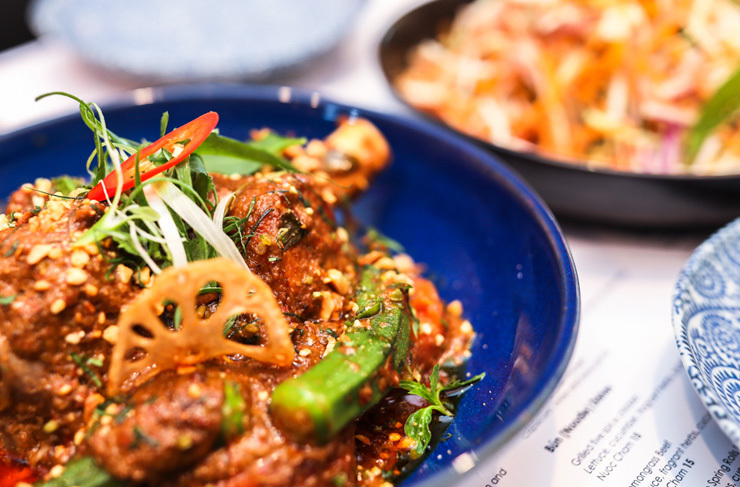 The service can be a little hit and miss, but there’s no arguing with slow-cooked lamb shank in Massaman curry, the famous crispy duck leg confit (highly recommend) or soft-shell crab with tamarind sauce. Consider this a step up from your basic Friday night Thai takeaway tub. And yes, there is a piano in the corner. Modern Australian, Modern Asian, A little bit in-between. That’s how Anchovy describes itself, and it’s pretty close to the mark. Owners Jia-Yen Lee and chef Thi Le cut their teeth at Cumulus and Supernormal Canteen, among others, so you can guess the level of cuisine you’re getting here. Mint tea when you sit down is a nice touch, but it’s the seasonal menu that blows your tiny mind. Pork scratchings with bay leaf salt, house-made roti, slathered in garlic sauce, Wagyu Carpaccio or stir-fried yabbies’—the food here is always surprising. Good for date nights or dinner with the in-laws. The clue’s in the title with this one: Maedaya is all about the sake. The giveaway is the giant wall of sake bottles that runs behind the bar. 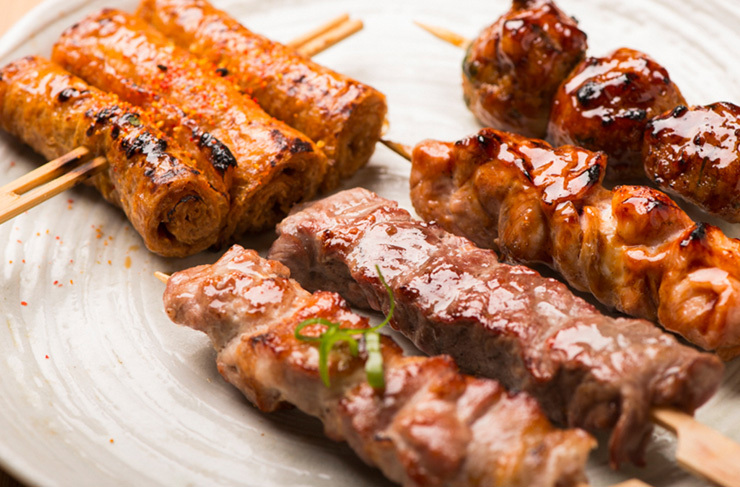 You can sit up here for sake flight tasting sessions, or grab a regular table and tuck into smoky Yakitori skewers, cooked over flame in the middle of the open kitchen. The pork gyoza are a good place to start, and make sure to order up a bowl of Ebi Wontons and a plate of Tako Karaage too. Maedaya is prefect for group bookings (and there’s a great private dining room upstairs) but it does get crowded, so make sure you book well ahead. Last tip? The Matcha Cheesecake Crumble. Gotta save room. Direct translation? ‘Eat drink’. And you’ll be doing a lot of both at An Uong, Bridge Rd’s premier Vietnamese restaurant. Now if you want down-and-dirty street Vietnamese, your dollar will go further on Victoria St, no doubt. But An Uong chefs things up a notch. Expect crispy tempura eggplant with chilli sauce, turmeric coconut Vietnamese crepes (Banh Xeo) topped with fish and delicate herbs, or maybe a cheeky Jasmine tea panna cotta. The prices are still very reasonable, and it’s not hard to have a cracking dinner for $30 a head. 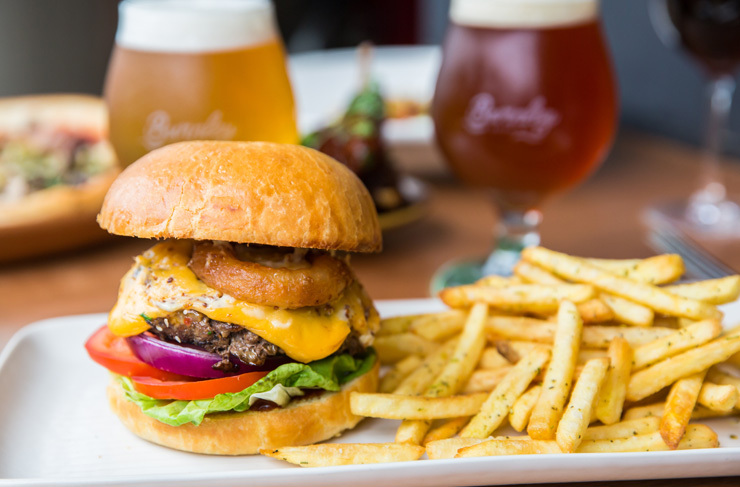 Make sure to throw in a glass of frosty Bia Hanoi Lager. Melbourne has embraced Neopolitan pizza to its fickle, black heart, and St Domenico does the best on Bridge Rd (although Burnley Brewing is certainly giving them a good shake). The crusts emerge from the Italian stone oven blackened and blistered, and the toppings are all A-Grade: San Daniele prosciutto, shaved leg ham, San Marzano tomatoes and housemade pork and fennel sausages. There’s no duds on the menu, but if we had to pick a star, it’d be the Fiorentina: Roma tomatoes with onion, olives, eggplant and fior di latte. Yep, we’ve gone the veggo pizza. Pulling no punches today. Bruschetta fans will appreciate the simplicity with this one: good tomatoes, basil and Extra Virgin. That’s it, folks. Full marks for the name, right? And Ladyboy doesn’t play things subtle: the first thing you notice when you walk in is a giant neon sign, which reads ‘Rock out with your wok out.’ Well, quite. The menu is the kind that gets your mouth drooling before anything’s landed on the table. Salt & pepper squid, heavy on the chilli, BBQ pork with sticky rice and nam jim jaew, house-cure Thai salmon ceviche. And that’s just the entrees. Owner couple Manpreet and Sumalee Singh have got the atmosphere just right in here: the perfect spot for after-work cocktails and a few cheeky shared plates. Wok on, baby. Vlado’s is about as far from the pop-neon of Ladyboy as it’s possible to get. A great example of Bridge Rd’s diversity. This one’s a heritage steakhouse that’s been pumping out sizzling beef since 1964. That’s a LOT of steaks. The fit-out hasn’t been changed much in all that time either: the walls are still covered with family photos, black and white pics of sports stars and celebrities (most of them tucking into a steak), pastoral paintings and decorative plates. Trendy it is not. Delicious it most certainly is. But be warned: good steak doesn’t come cheap. The classic Set Menu will set you back $105, which is hefty in anyone’s language, but it does come with appetiser, entrée, dessert and an insanely marbled eye fillet. You’ve found our weakness, Bierkeller: timber-lined Austrian beer halls with bunting over the bar, pork knuckles on the table, and giant polar bears by the door (call us crazy, but we just love this sort of shameless, clichéd pomp). If you’re a fan of Hofbrauhaus and Munich Brauhaus, consider Bierkeller you’re new watering hole. It’s almost a crime to come here and not order a schnitzel the size of your head, but beyond that the beer cheese fritter with Lingonberry jam is surprisingly good, as are the beer pretzels with Austrian mustard (you sensing a theme here?). Wash it all down with a giant stein of Saku Antvark. Prost! Got a hankering for Korean BBQ on Bridge Rd? Noda is the spot. The first thing you notice in here is the ceiling: a glowing constellation of mismatched lanterns, and half a dozen huge, snake-like copper chimney tubes dangling down towards the tables. Noda does run a signature ‘Fried Chicken Feast’ at dinnertime, which is bloody tempting (picture KFC boxes of garlic and soy with cheesy corn and cabbage—so good). But really, you have to try the Korean barbecue. The Beef Set for two will set you back $59 and comes with Wagyu scotch fillet, beef bulgogi, short ribs, brisket and ox tongue. The daily banchan side dishes rotate all the time, but you can expect the usual range of pickles, chilli things and useful lettuce-leaf scoops. Another modern Vietnamese restaurant leading the Bridge Rd charge. Paper Plate is all class on the inside: exposed bricks, matt black pendant lights, good conversation and sultry sophistication by the bucketload. The menu’s no slouch either. Swing by for lunch and inhale some pork belly rice paper rolls, caramelised chicken wings and a big bowl of grilled five-spice chicken, served with cucumber, pickle, vermicelli noodles and nuoc cham sauce. Very decent serve for $15. Drinks-wise, it’s gotta be the Lemongrass Lychee Martini. Sweet, fragrant and kicks like an enraged ox. Jumping continents now over to Greece, and the ever-popular Kritamos. The corner location is cosy, without being crazy on-trend—Kritamos prefers to let the Hellenic food to the talking. The food is traditional Greek, with a few subtle nods to the rest of the Mediterranean. Start with the saganaki—grilled squeaky gold kefalograviera cheese, with a side of lemon. The char-grilled peppers topped with feta are good too, salty and satisfying. It’s not too hard when you get to mains: load up with their chicken or lamb Yiros, throw in a plate of lightly fried calamari and blow the buttons off those jeans with a serve of eggplant moussaka. A brilliant family night out, or cheeky mid-week date spot. Kritamos nails it every time. You said it, boys. Who doesn’t love a good dump party? There’s a few I Love Dumpling houses over town (Kensington, CBD, Brunswick, St Kilda), and Richmond is pretty much more of the same. ‘Same’ in this case means epic plates of fried chicken and prawn (15 for $11.80—not too shabby), steamed gluten-free pork dumplings (12 for $12) and gluten-stuffed BBQ pork buns (4 for $10.80). Grab a bunch of mates, pick a Thursday night, and head down for an excellent time. Round out the table with some obligatory poached Chinese broccoli, swimming in oyster sauce, and stir-fried eggplant with umami and garlic. Split bill, because that’s the dumpling code. Feeling Swan St tonight instead? No worries. We've rounded up the best things to eat, see and do on Swan St.